Online Application Details for The Shamrao Vithal Co-operative Bank Ltd SVC Bank Recruitment of Branch Manager and Assistant Manager is given below. Candidate's minimum education qualification for the Vacancies in The Shamrao Vithal Co-operative Bank Ltd SVC Bank should be C.A. / I.C.W.A. / C.S. / M.B.A. 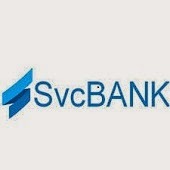 Selection for the post of Branch Manager and Assistant Manager for job openings in The Shamrao Vithal Co-operative Bank Ltd SVC Bank is based on Personal Interview. Application form and duly attested documents are to be sent to Divisional Manager - Human Resource Management The Shamrao Vithal Co-operative Bank Ltd. 5th Floor, Corporate Office, SVC Tower, J.N. Road, Vakola, Santacruz (East), Mumbai – 400055. In envelope super scribed with 'Application for the Post of Post Name'.